The second phase of Lyrita’s analogue heyday came in the early 1970s. 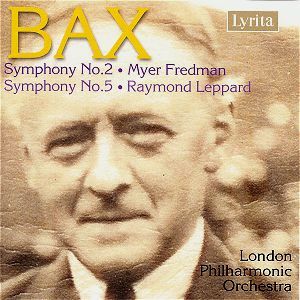 So far as Bax symphonies were concerned they were content to fill in around the efforts of two other companies. The Third Symphony had been recorded by RCA with the LSO conducted by Edward Downes. It has never had an issue on CD - a rather lacklustre affair, I thought at the time. The Fourth was produced even earlier by the Guildford Philharmonic Orchestra and Vernon Handley, forces later used by Lyrita but at that time favoured by the Revolution label. The recording of No. 4 was rather shrill but the performance was spirited. Both these LPs had an evanescent presence on the shelves. They were flawed in one way or another and soon slipped from view. Even so, Lyrita moved with good judgement to make world premiere recordings of the remaining Bax symphonies. No. 6 came in the first Lyrita phase in the mid-1960s. The second phase saw the issue of three then still desperately unfashionable symphonies in quickish succession. The first two (Nos. 1 and 2) were issued in consecutive months sporting sponsorship from Ken Russell Productions Ltd. The Fifth had to wait until the following year with the Seventh coming out in the third issue phase in 1975. These discs made the Bax renaissance and might even have been its authors for most people of the generation that had grown up since Bax’s death. Their confidence in accomplishment swept all doubts aside among the growing ranks of open-minded admirers and enquirers although there certainly remained people who had no time for these works. The Lyrita sessions captured nothing faltering or academic. There is a remarkable tenderness in the first movement of the Fifth Symphony with the gentle touching in of celesta chimes. An exultant rowdiness to Bax’s climaxes never becomes tawdry and there is a headiness to the great pliant melody that strides through the second movement of the gaudy and awesome Second Symphony. The spangled dazzling colours of the Fifth are memorable for their astonishingly candid rhythmic emphasis and forthright and charismatic brass writing. Time after time Bax irresistibly whirls the listener into the action. He is a master of colour though his orchestration can seem dense even if that very density has a wild glamour of its own. It is that subtlety of colours and direct speaking that shouts Bax as in their different accents and idiosyncrasies the symphonies of Sibelius, Martinů and Nielsen shout their own authorship. Try the horizon-tilting brass fanfares and underpinning glimmer of harp and violins at the very start of the second movement of No. 5 for another example of mastery. Yet more originality can be heard in the second movement where tuba and flailing clarinet figures counterpoint each other. There is a crackling feral voltage in this passage before the music sweeps on to even stranger realms. The kinetic head-banging power of the start of the third movement is also remarkable. The tension hardly ever lets up and the narrative arc remains intact all the way through Leppard’s reading. This continues through to those roaringly clamant final bars with the shrapnel-staccato of the rimshot tattoo. Sadly when Leppard took the work to the Proms many years later on 24 July 1984 with the BBC Northern Symphony Orchestra it drew only a small audience, was memorable for a drastically cracked trumpet note and had a less than cogent trajectory. Comparisons: There is no identical coupling so if you need just these two symphonies this is a compelling choice. The analogue sound is very healthy despite being pushed to the limits in the overwhelming climaxes. Looked at individually, in a blessedly crowded market, these two remain at the top of the recommendation list or very close. I say that in the face of the Handley-Chandos box, the Thomson-Chandos cycle (which has a pretty good No. 5, by the way) and the Lloyd-Jones-Naxos sequence. But for the frail sound of the Dutton CD of Goossens’ 1950s broadcast of the Second Symphony I would have been bracketing the Dutton and the Fredman together. Handley would have been on their heels. Outright Baxians must hear the Goossens but for most practical purposes you will have heard the Second Symphony at its finest with Fredman. Handley is a close second - a degree or so cooler but not far behind. This generously timed disc is well supported by liner notes from Lewis Foreman and Robert Layton. Lyrita, Fredman and Leppard recreated a Baxian tradition in the 1970s but these two readings have a grip that transcends mere documentary interest.